The theme that I have chosen for this blog is titled ‘Manifest’. It is minimal and charming in its design approach, while incorporating many design aesthetics in order to maximise viewer potential. Any writing published on the blog is featured in a single column structure. This captures the reader’s eye, prevents subliminal distractions and suggests contextual reading behind the words. In addition, the single column structure is strategically positioned in the centre of the page. This creates a large formatting of white space on either side of the column, which inadvertently makes the column (and, by extension, its words) stand out. Lines (in correlation with the publishing date) are used simplistically in order to divide the individual posts. This creates an artificial aspect of space and cleanliness within the blog, while also providing readers with valuable information. The words ‘Leave a comment’ are present at the end of every post. These are distanced from the writings of the post and are coloured in a faded grey, in order to draw the reader’s eye towards it upon completion of the article, but not detract from the given post. Upon selection, this element was taken into consideration, as it stimulates a higher creator-viewer feedback. 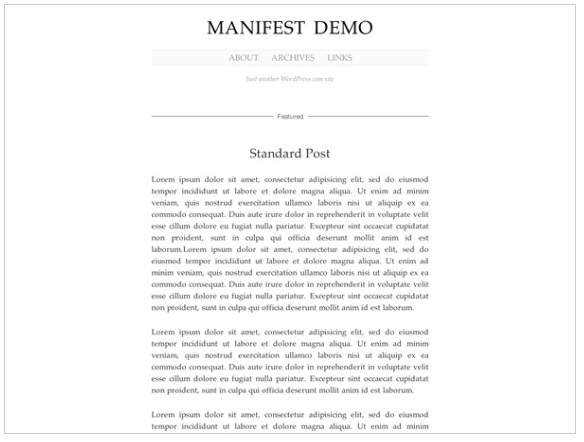 The ‘Manifest’ theme allows for the title/header to be featured in the upper-centre of the home page, making it the first thing a reader’s eye is draw to. Posts are immediately featured underneath the said title/header in order to stimulate the transferral of interest from the title/header to the given posts. This both engages the audience and creates a form of focused viewing behaviour. The overall aesthetics of the theme suit my given style, as I enjoy minimalist blogs that do neither to distract nor detract from the featured content.